The apartment sleeps 4 and is right in the centre of Les Bruyeres / Les Menuires. The back door from the ski locker room is opening straight onto the slopes. The balcony is facing the valley and provides stunning views of the mountains. Three Valleys is the biggest ski area on the planet with over 600km of slopes and 200 ski lifts, gondola, cabins etc. The apartment is right on the slopes with no walking required (ski on, ski off). Les Menuires is just below the highest ski resort in Europe and is located at 1800m with snow from beginning of December till May. Within 50m of the entrance of the building there are 6 restaurants, a mini-supermarket, open air swimming pool, cinema and ski rental shops. The ESF (ski school) is 100m away - same level. Paris (650 km) – Lyon (183 km). From Paris: Motorway to Albertville, then the dual carriageway to Moûtiers and the D915 to Les Menuires. In Les Menuires, follow the road to Val-Thorens/Les Bruyères for 1 km, then turn left for Les Bruyères. Ski Soleil is 500 m on the left (near the sports centre, swimming pool and skating rink). Snow train from Central London to Moutiers. MOUTIERS railway station (27 km). Connections via Altibus – Tel: + 33 0(4) 79 00 73 9..
Travel information – Tel: 0826 800 826. Satobus - Tel: + 33 (0)4 37 255 255. Travel information – Tel: +41 22 717 71 11. Aéroskibus - Tel: +41 22 798 20 00. Travel information – Tel : +33 (0) 4 79 54 49 54. Lep apartma prav ob progi Reberty. We've spent the best Christmas and New Year ever, our kids absolutely loved the resort and familiarised very quickly with the surroundings. The apartment is very conveniently situated at the same level with the parade of shops in Les Bruyeres and very close to the beginners slope. This was the second time we stayed in this apartment and we will definitely come back again. Soon. Fairly basic accomodation - accurate description and very good location- ski in and out. Offers good value for money. The owner provided very good customer service - great communcation at all stages of the booking. 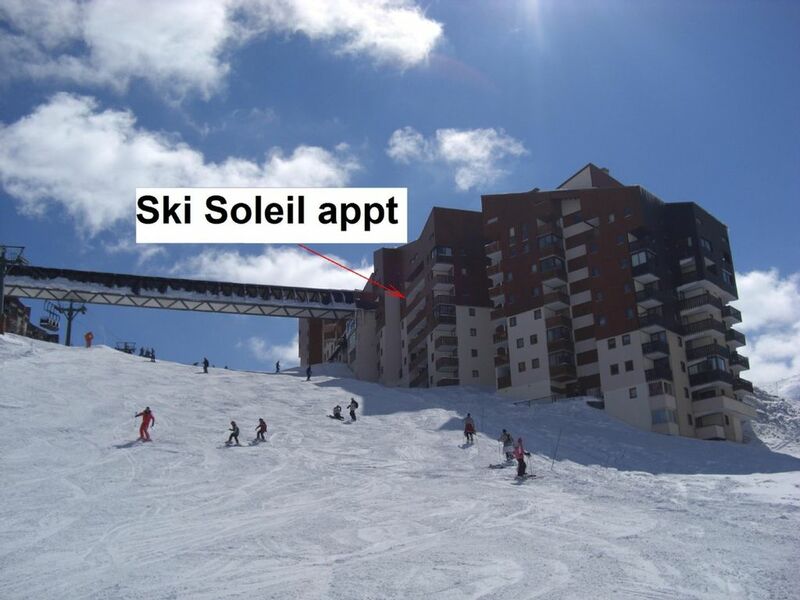 I would recommend this property to anyone who wants to ski the 3 valleys on a budget - it will take you a few lifts to get over to Meribel. Accomodation was clean and various amenities within the location are perfectly adequate. Located in the heart of Olympic Savoy, Les Menuires resort belongs to the famous Three Valleys, the world’s biggest ski area. The wide, perfectly exposed site is very sunny. Les Ménuires is a sports enthusiasts’ and thrill-seekers’ paradise as well as a family resort with many activities for non-skiers. But this friendly, functional place is above all a ski resort where you can literally set off for the slopes with your skis on. --- Downhill skiing : 600 km of runs. --- Snowboard : 4 snowparks. --- Cross country skiing : 130 km of runs. --- 70 km walking paths. You can enjoy outstanding views of the entire Alps from Mont de la Chambre or Pointe de la Masse (elevation 2,850 m), accessible by cable-car. Enjoy snowshoe hikes where you can see snow-covered peaks, villages nestling in the valley and a host of grandiose landscapes. Ski pass shop is 50m from the entrance to the buiilding. Ski rental shops - at least 4 within 100m from the entrance to the building.